New russian gallery in London- Orel. On 22 April, Orel Art launched its London premises in an impressive 350sqm space at 7 Howick Place, London SW1, currently the prestigious address of Phillips de Pury & Company. An expansion from the Paris-based gallery and a major addition to the London art market, Orel Art will be primarily devoted to bringing contemporary Russian art to a wider western audience. The gallery will also provide a fresh platform for topically engaged international artists to implement inventive and challenging site-specific projects. Director Ilona Orel, operating from Paris, has played an instrumental role in raising the profile of Russia’s most significant contemporary and emerging artists through a series of acclaimed exhibitions. Founded in 2001, the pioneering space supported the careers of Andrei Molodkin, Valery Koshlyakov, Vladimir Dubossarsky and Alexandre Vinogradov,Georgy Gurianov, Komar & Melamid and Olga Tobreluts, alongside emerging artists including Dasha Fursey and Chtak. Daughter of an artist and former student of the Moscow School of Painting, Sculpture and Architecture, Orel’s experimental ethos is informed by her direct experience of the challenges faced by young artists. Orel is acutely aware of the pre-eminence of visual culture in contemporary society and strives to promote artists who address current affairs and globalized problems with exceptional aesthetic prowess. Looking beyond internal curatorial projects, Ilona Orel has fostered successful collaborations with established European museums, including the Tretiakov National Gallery in Moscow, the National Russian Museum in St Petersburg and MACRO in Rome. Her stable of artists has entered the prestigious collections of the Pompidou Centre in Paris, the Guggenheim Museum in New York and Bilbao, the Martin-Gropius Bau in Berlin and the MAK Museum in Vienna, amongst others. 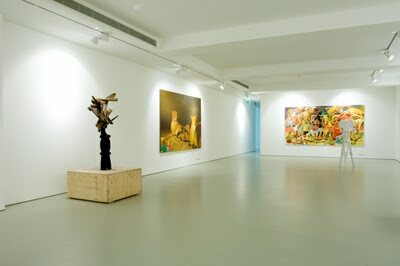 Today, under Orel’s distinctive direction, the Howick Place gallery is set to deliver an outstanding programme of solo exhibitions and group shows, bringing together Russian contemporary artists, established curators and international figures such as Raffaella Nappo, Stephen Shanabrook, Rupert Shrive and Ivan Messac. To spearhead this agenda, Orel Art will launch with Liquid Modernity (Grid and Greed), the first UK solo show of Andrei Molodkin, the artist representing Russia at the forthcoming 53rd Venice Biennale. The show will be curated by celebrated scholar Victor Tupitsyn, who sits on the advisory board for Third Text, with the catalogue written by Margarita Tupitsyn, Co-Curator of ‘Rodchenko and Popova’ at Tate Modern.